If we knew how to make our own cleaning products to replace the toxic, commercial ones . . . would we? Would we put forth the effort required? The desire to make my own products stemmed from the frugal, self reliant side of me. I wanted simple; homemade; natural. Remember the definition of simple is NOT ‘easier.’ Living “simply” in our times, means making a deliberate choice to differ from the mainstream of today’s societal norm. My desire changed over to sheer determination, when one of my children was diagnosed with a myriad of allergies, chemical sensitivities, and asthma. After much study and research, we were determined that we could not have those products in our home, they are useless (when God has provided all we need to make our own) and harmful to everyone in our home. Join me, as I show you how to easily make your own natural, homemade, handcrafted products that are not only less expensive but truly better for our families, our home and God’s Creation. What a handy book to keep around! Lisa Barthuly has written a good sense dialogue, understandable – and as Lisa affirms herself – not always easy to formulate, but healthy and effective to the needs each formula addressed. The listing of contents impressed me at how effortlessly each chapter could be found by only a few descriptive words in the title. It was fun to see the pictures she added at the beginning of each section. The skin is our biggest organ and everything you put on it or around it gets absorbed INTO it. I added this sentence as a separate paragraph, because of its utmost importance of why we should possibly reassess what we are putting next to our skin and into our systems altogether. Every page of this book was educational, inspirational, and informative of the “art of natural” – and I made many notes. The cost differences between the commercial and homemade products is astounding. The fascinating subject of essential oils and how they should be used is new to me and a definite must on my “gotta learn list.” Oh…and the things one can do with vinegar in a thousand different ways, no less than baking soda, borax, herbs, and potpourri made from flowers from your garden. Don’t forget to collect those old spray bottles, canning jars, etc., because you’ll need all of this equipment to make everything from killing mold to freshen vegetables, from smelly feet to bad breathe. 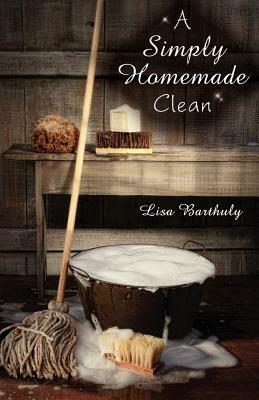 Lisa Barthuly’s enthusiasm and belief in what she writes is clear and enlightening. My own enthusiasm grew with each page and new idea to try. She wrote some very easy and simple hints so perhaps you wouldn’t be frightened away from learning the “old-new” remedies to keep your family safe from possible life threatening diseases and illnesses the manufactured products might cause. She wrote timely true facts from researched and well written information that should be made aware to all. Lisa has made a lucid example of herself through her ways of saving money as well as mentoring good health. Lisa has my admiration and respect for caring enough about others to write about seeking God’s ways in each area of your everyday life. Already I have recommended her book to family and friends, and will continue to do so in my community, my place of worship, and in conversations. Most of all, in sharing what these examples will do for others – I will prove that one is never too old to learn!